Let your soul be dissolved in the magical music of virtuoso ROBY LAKATOS!!! With regards to keep the group soul and seat together for easy socialising, making new friends, having fun and a great time our volunteer will buy the tickets for group members. No stress, Your place and ticket gone wait You! *Hurry up, places are limited! The last day to buy tickets – 24th of December. Some, who wants to buy ticket independently may seat a part, on personal choice. Gypsy violinist Roby Lakatos is not only a scorching virtuoso, but a musician of extraordinary stylistic versatility. 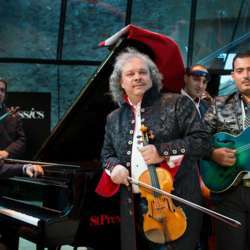 Equally comfortable performing classical music as he is playing jazz and in his own Hungarian folk idiom, Lakatos is the rare musician who defies definition. He is referred to as a gypsy violinist or “devil’s fiddler”, a classical virtuoso, a jazz improviser, a composer and arranger, and a 19th-century throwback, and he is actually all of these things at once. He is the kind of universal musician so rarely encountered in our time—a player whose strength as an interpreter derives from his activities as an improviser and composer. He has performed at the great halls and festivals of Europe, Asia and America. Roby Lakatos was introduced to music as a child and at age nine he made his public debut as first violin in a gypsy band. His musicianship evolved not only within his own family but also at the Béla Bartók Conservatory of Budapest, where he won the first prize for classical violin in Protected content . Between Protected content 1996, he and his ensemble delighted audiences at « Les Atéliers de la grande Ile » in Brussels, their musical home throughout this period. He has collaborated with Vadim Repin and Stéphane Grappelli, and his playing was greatly admired by Sir Yehudi Menuhin, who always made a point of visiting the club in Brussels to hear Lakatos. In March Protected content , Lakatos appeared to great acclaim with the London Symphony Orchestra in the orchestra’s “Genius of the Violin” festival alongside Maxim Vengerov.